The thousands of faithful, unsung Saints who endured the rigors of the westward trek and colonization left us a spiritual heritage to treasure. In 1947, the centennial of the arrival of Latter-day Saint pioneers in the Salt Lake Valley, many tributes were paid to those who set their faces toward Zion and wore out their lives in pursuit of that spiritual homeland. One of the most poignant of those tributes was voiced by President J. Reuben Clark Jr., First Counselor in the First Presidency, in a general conference address Sunday, 5 October 1947. That address is now reprinted in tribute to those early pioneer Saints as well as to the millions of Saints today who trek across plains of personal trial and deserts of worldly perils toward their spiritual homeland. My brethren and sisters, I should like in the beginning to add my testimony to the many that we have heard during this conference—my testimony that God lives; that Jesus is the Christ, the Redeemer of the World, the First Fruits of the Resurrection; that Joseph Smith was a prophet; that through him the gospel was restored and likewise the priesthood, the authority delegated to man on earth to represent Deity here among us; and that the Prophet has been followed down to and including our present president, George Albert Smith, by men who possessed the keys of the last dispensation as conferred upon Joseph Smith. The matter that I shall give you today is very dear to my soul. Since I should like to say what I have to say in the best way I can say it, I have written it down and shall read it. I hope that what I shall say will be in harmony with the spirit of this great conference—I think the greatest I have attended in its high spiritual tone. At the near close of this one hundredth year of the entering into these valleys of your fathers and your mothers, some of yours and mine, I wish to speak a few further words of humble tribute and thanksgiving to them, and especially to the meekest and lowliest of them, those great souls, majestic in the simplicity of their faith and in their living testimony of the truth of the restored gospel, to those souls in name unknown, unremembered, unhonored in the pages of history, but lovingly revered round the hearthstones of their children and their children’s children who pass down from generation to generation the story of their faith and their mighty works, and the righteousness of their lives and living, those souls who worked and worked, and prayed and followed, and wrought so gloriously. I would not take away one word of praise or gratitude, honor or reverence from the great men who led these humble ones of ours. They were mighty men in brain and brawn, in courage and valor, in honesty and in love of truth, living near the Lord—Brothers Brigham and Heber and Wilford and Willard and Charles, the two Orsons and Parley and John and George and Erastus and Lorenzo and Daniel and Joseph and Jedediah, and a host of other giants, each and all richly blessed with the Lord’s divine love and with that gift of the Holy Ghost that made them leaders truly like unto Moses of old. I yield, we yield, to no one in our gratitude for them and for their work of directing the conquest of the wilderness and of saving men’s souls. Their names shine lustrously on those pages of history which record only the doings of the makers of epochs—those choice spirits, chosen before the foundation of the world, to be the leaders and builders of dispensations of God’s dealings with men; and these leaders of ours to be the builders of that dispensation which of old was named the “dispensation of the fulness of time[s]” [Eph. 1:10; D&C 112:30]. Unnumbered eternities will remember and honor them. But I should like now and here to say a few words about those who trod after where those giants led, some in the same companies that the Brethren piloted, some in later companies following that year and the years after, some in the fateful handcarts, with their unexcelled devotion, heroism, and faith, all trickling forward in a never-failing, tiny stream, till they filled the valley they entered and then flowed out at the sides and ends, peopling this whole wilderness-waste which they fructified, making it to fulfill the ancient prophecy that the desert should blossom as the rose. I would like to say something about the last wagon in each of the long wagon trains that toiled slowly over the plains, up mountain defiles, down steep, narrow canyons, and out into the valley floor that was to be home—this last wagon: last, because the ox team that pulled it was the smallest and leanest and weakest, and had the tenderest feet of any in the train; it was slow starting, and slow moving; last, because, worn and creaking, it took more time to fix and to grease, for young Jimmy generally had trouble in getting the wagon jack under the “ex” [the point where a shaft called the “reach” crosses the axle]; last, because its wind-rent cover was old and patched and took hours to mend and tie up to keep out the storm; last, because the wife, heavy with child, must rest till the very moment of starting; last, because sickly little Bill, the last born, poorly nourished, must be washed and coaxed to eat the rough food, all they had; last, because with all his tasks—helping little Bill, cooking and cleaning up the breakfast (Mother was not able to help much)—Father took a little longer to yoke his cattle and to gird himself for the day’s labor; last, because his morning prayers took a few more minutes than the others spent—he had so many blessings to thank the Lord for and some special blessings to ask the Lord to grant, blessings of health and strength, especially for his wife, and for little Bill, and for the rest, and then the blessings for himself that his own courage would not fail, but most of all for the blessing of faith, faith in God and in the Brethren who sometimes seemed so far away. For they were out in front where the air was clear and clean and where they had unbroken vision of the blue vault of heaven. The Brethren had really visioned the glory of the Lord, who walked near them, put his thoughts into their minds; his Spirit guided and directed them, petitioned thereto by the thousands of Saints who were back in Winter Quarters, back in Iowa, back in the States, and beyond, even across the waters, for the faithful poured out their souls in fervent prayer to Almighty God that the Brethren should be inspired. The Saints buoyed up the Brethren out in front with encouragement, with praise, and sometimes even with adulation. Knowing the Brethren were prophets of God, the Saints gave them full confidence, daily, almost hourly, expressed. The Brethren lived in a world of commendation from friends and the tried and true Saints. Rarely was their word or their act questioned by the faithful Saints. This was as it should be and had to be to carry out the Lord’s purposes. When the vision faded, their hearts sank. But they prayed again and pushed on, with little praise, with not too much encouragement, and never with adulation. For there was nearly always something wrong with the last wagon or with its team—the off ox was a little lame in the right front shoulder; the hub of the left front wheel was often hot; the tire of the hind wheel on the same side was loose. So corrective counsel, sometimes strong reproof, was the rule, because the wagon must not delay the whole train. But yet in that last wagon there was devotion and loyalty and integrity, and above and beyond everything else, faith in the Brethren and in God’s power and goodness. For had not the Lord said that not even a sparrow fall[s] unnoticed by the Father [see Matt. 10:29], and were they not of more value than sparrows? And then they had their testimony, burning always like an eternal fire on a holy altar, that the restored gospel was true, that Joseph was a prophet of God, and that Brigham was Joseph’s chosen successor. When the train moved forward in the early morning sun and the oxen with a swinging pull that almost broke the tongue got the last wagon on the move, the dust in the still morning air hung heavy over the road. Each wagon from the first stirred up its own cloud, till when the last wagon swung into line, the dust was dense and suffocating. It covered that last wagon and all that was in it; it clung to clothes; it blackened faces; it filled eyes already sore, and ears. The wife, soon to be a mother, could hardly catch her breath in the heavy, choking dust, for even in the pure air she breathed hard from her burden. Each jolt of the wagon, for those ahead had made wagon ruts almost “ex” deep, wrung from her clenched lips a half-groan she did her best to keep from the ears of the anxious, solicitous husband plodding slowly along, guiding and goading the poor, dumb cattle, themselves weary from the long trek. So through the long day of jolting and discomfort and sometimes pain, and sometimes panting for breath, the mother, anxious only that the unborn babe should not be injured, rode, for she could not walk; and the children walked, for the load was too heavy and big for them to ride; and the father walked sturdily alongside and prayed. When in the evening the last wagon creaked slowly into its place in the circle corral and the Brethren came to inquire how the day had gone with the mother, then joy leaped in their hearts, for had not the Brethren remembered them? New hope was born, weariness fled, fresh will to do was enkindled; gratitude to God was poured out for their knowledge of the truth, for their testimony that God lived, that Jesus was the Christ, that Joseph was a prophet, that Brigham was his ordained successor, and that for the righteous a crown of glory awaited that should be theirs during the eternities of the life to come. Then they would join in the songs and dancing in the camp, making the camp’s gaiety their own—as much as Mother’s condition would permit. Then the morning came when from out that last wagon floated the la-la of the newborn babe, and Mother love made a shrine and Father bowed in reverence before it. But the train must move on. So out into the dust and dirt the last wagon moved again, swaying and jolting, while Mother eased as best she could each pain-giving jolt so no harm might be done her, that she might be strong to feed the little one, bone of her bone, flesh of her flesh. Who will dare to say that angels did not cluster round and guard her and ease her rude bed, for she had given another choice spirit its mortal body that it might work out its God-given destiny? My mother was one of those babes so born in 1848, ninety-nine years ago. Another morning came, when courageous little Bill, who, with a hero’s heart, had trudged through long days of hot sun and through miles of soggy mud in the rain, his little body drenched, little Bill, weak and wan, must be crowded in to ride with Mother, for he was sick from a heavy cold. Months before, on that cold winter’s night when they fled Nauvoo for their lives to escape the fiendish wrath of a wild mob, Bill became dangerously ill with pneumonia, which left him with weak lungs. This old illness now returned. He grew worse and worse. The elders came and prayed he might get well. But the Lord wanted little Bill with Him. So a few mornings later a weeping mother and a grief-stricken father and that last wagon swung into place in the line, leaving beside the road, under some scrub brush, a little mound, unmarked save for heaped up rocks to keep out the wolves, a mound that covered another martyr to the cause of truth. So through dust and dirt, dirt and dust, during the long hours, the longer days—that grew into weeks and then into months, they crept along till, passing down through its portals, the valley welcomed them to rest and home. The cattle dropped to their sides, wearied almost to death; nor moved they without goading, for they too sensed they had come to the journey’s end. That evening was the last of the great trek, the mightiest trek that history records since Israel’s flight from Egypt, and as the sun sank below the mountain peaks of the west and the eastern crags were bathed in an amethyst glow that was a living light, while the western mountainsides were clothed in shadows of the rich blue of the deep sea, they of the last wagon, and of the wagon before them, and of the one before that, and so to the very front wagon of the train, these all sank to their knees in the joy of their souls, thanking God that at last they were in Zion—“Zion, Zion, lovely Zion; Beautiful Zion; Zion, city of our God!” [Hymns, no. 44]. They knew there was a God, for only he could have brought them, triumphant, militant, through all the scorn, the ridicule, the slander, the tarrings and featherings, the whippings, the burnings, the plunderings, the murderings, the ravishings of wives and daughters, that had been their lot, the lot of their people since Joseph visioned the Father and the Son. But hundreds of these stalwart souls of undoubting faith and great prowess were not yet at their journey’s end. Brother Brigham again called them to the colors of the kingdom of God, and sent them to settle the valleys, near and remote, in these vast mountains of refuge. 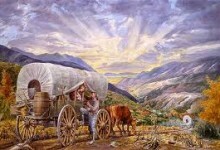 So again they yoked their oxen and hitched up their teams, and putting their all in the covered wagon, this time willingly, unwhipped by the threat of mob cruelty and outrage, they wended their slow way to new valleys again trusting with implicit faith in the wisdom and divine guidance of their Moses. The very elements obeyed their faith, faith close kin to that which made the world. These tens of thousands who so moved and so built were the warp and the woof of Brother Brigham’s great commonwealth. Without them Brother Brigham had failed his mission. These were the instruments—the shovelers, the plowers, the sowers and reapers, the machinists, the architects, the masons, the woodworkers, the organ builders, the artisans, the mathematicians, the men of letters, all gathered from the four corners of the earth, furnished by the Lord to Brother Brigham and the prophet leaders who came after, that he and they might direct the working out of His purposes. These wrought as God inspired Brother Brigham and the other prophets to plan, all to the glory of God and the upbuilding of His kingdom. Upright men they were, and fearless, unmindful of what men thought or said of them, if they were in their line of duty. Calumny, slander, derision, scorn left them unmoved, if they were treading the straight and narrow way. Uncaring they were of men’s blame and censure, if the Lord approved them. Unswayed they were by the praise of men, to wander from the path of truth. Endowed by the spirit of discernment, they knew when kind words were mere courtesy, and when they betokened honest interest. They moved neither to the right nor to the left from the path of truth to court the good favor of men. So for a full hundred years, urged by the spirit of gathering and led by a burning testimony of the truth of the restored gospel, thousands upon tens of thousands of these humble souls, one from a city, two from a family, have bade farewell to friends and homes and loved ones, and with sundered heart strings, companioned with privation and with sacrifice even to life itself, these multitudes have made their way to Zion, to join those who were privileged to come earlier, that all might build up the kingdom of God on earth—all welded together by common hardship and suffering, never-ending work and deep privation, tragic woes and heart-eating griefs, abiding faith and exalting joy, firm testimony and living spiritual knowledge—a mighty people, missioned with the salvation not only of the living but of the dead also, saviors, not worshippers of their ancestors, their hearts aglow with the divine fire of the spirit of Elijah, who turns the hearts of the fathers to the children and of the children to the fathers. And thousands upon thousands of these tens of thousands, from the first till now, all the elect of God, measured to their humble calling and to their destiny as fully as Brother Brigham and the others measured to theirs, and God will so reward them. They were pioneers in word and thought and act and faith, even as were they of more exalted station. The building of this intermountain empire was not done in a corner by a select few but by this vast multitude flowing in from many nations, who came and labored and wrought, faithfully following their divinely called leaders. So to these humble but great souls, our fathers and mothers, the tools of the Lord, who have, for this great people, hewed the stones and laid the foundations of God’s kingdom, solid as the granite mountains from which they carved the rocks for their temple, to these humble souls, great in faith, great in work, great in righteous living, great in fashioning our priceless heritage, I humbly render my love, my respect, my reverent homage. God keep their memories ever fresh among us, their children, to help us meet our duties even as they met theirs, that God’s work may grow and prosper till the restored gospel of Jesus Christ rules all nations and all peoples, till peace, Christ’s peace, shall fill the whole earth, till righteousness shall cover the earth even as the waters cover the mighty deep [see Moses 7:62]. Let us here and now dedicate all that we have and all that we are to this divine work. May God help us so to do.